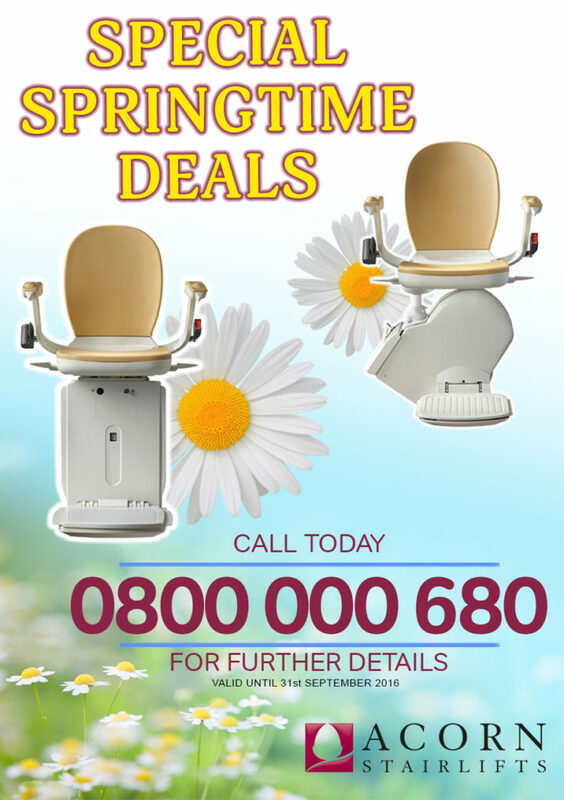 Spring is in the air and in order to celebrate this special season, Acorn Stairlifts is running a Spring Special within the month of September. A Stairlift can be very easily and quickly installed to your existing staircase thanks to Acorn being fully equipped in South Africa and with national coverage. Stairlifts do not require any major structural changes to the home and they do not damage the stairs or home decor. They are designed for quiet, efficient operation and are battery operated with the charging being from normal house current. Be your staircase straight or curved Acorn Stairlifts will have a solution for you. Some important factors to consider when buying a Stairlift are as follows. The chair and built-in footrest fold up when not in use freeing up space in the passage. Acorn Stairlifts provides aftersales support from our own in-house trained service technicians. Our products withhold a 1 year warranty thereafter an extended service agreement may be entered into. Spring is in the air and in order to celebrate this special season Acorn is running a Spring Special within the month of September. Perhaps you require a Stairlift now? planning for the future? Then why not call us to arrange a non-obligation quotation on Freecall number 0800 000 680 and one of our friendly sales agents will be on hand to take your call and we will put the Spring in your steps with an Acorn Stairlift. I am very pleased that I choose Acorn when I originally decided to have a chairlift installed as your service at your office and now in the field has been outstanding. May you go from strength to strength. Well done. I am delighted with my stairlift – thank you! Johnathan was such a joy to work with – he was competent, punctual and explained everything clearly to me, and he needed patience of which he had abundance!!! I am so much more confident in my husband’s homecoming and it has given me additional peace of mind. I thank you sincerely for all the attention you have given me. I was blessed to find you and Acorn.